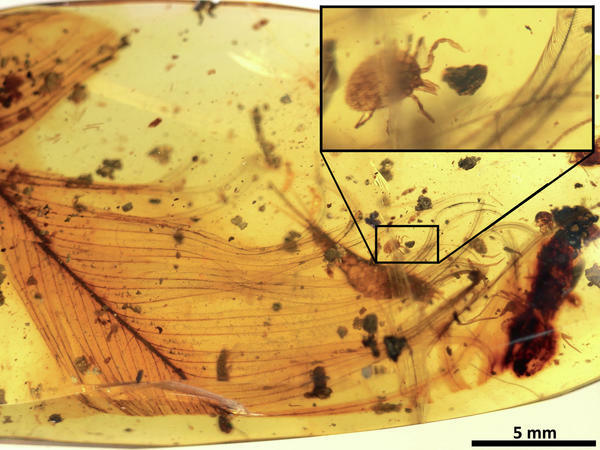 A tick grasping a dinosaur feather is preserved in 99 million-year-old amber from Myanmar. Deinocroton draculi ticks, preserved in amber, are named for the blood-sucking vampire Dracula and are a newly discovered ancient species. Ticks sucked the blood of feathered dinosaurs some 99 million years ago, a new study suggests. Modern ticks are infamous for biting humans and other mammals. But ticks are very ancient, and scientists who study their evolution have long wondered what (or who) the little vampires ate before there were lots of mammals to feed on. Feathered dinosaurs apparently were among the possible creatures on the menu. The findings rely partially on amber specimens from Myanmar. In one of them, a tick is trapped in the hardened resin alongside a feather from a dinosaur that lived during the Cretaceous Period. "Amber is fossilized resin, so it's able to capture small bits of the ecosystem almost instantly," says Ricardo Pérez-de la Fuente, a research fellow at the Oxford University Museum of Natural History and an author of the study published Tuesday in the journal Nature Communications. "Amber can actually preserve interactions between organisms. This is the case with the feather and the grasping tick." The tick-and-feather pair support a theory that Pérez-de la Fuente had already spent years developing, based on other ticks trapped in amber from the same period. Those ticks didn't have dinosaur feathers encased with them, but there were little hairs. The hairs resemble those left behind by a type of beetle larva that, today, lives in bird nests. "We had this indirect evidence about the relationship between ticks and feathered dinosaurs," Pérez-de la Fuente says, but the researchers didn't have any direct evidence for the relationship until they saw the tick and feather trapped together in amber. "The paper is a pleasant surprise," says Ben Mans, a paleontologist who has studied tick evolution but wasn't involved in the current study, in an email to NPR. Until now, he says, researchers assumed ancient ticks fed on the blood of early amphibians, reptiles and the ancestors of modern mammals, not on feathered dinosaurs. Mans cautions the evidence doesn't necessarily exclude other types of animals, since feathered dinosaurs were not the only ones that lived in nests. He also says follow-up research needs to be done to understand how a new ancient species of tick identified in the study fits into the bigger tick family tree. Pérez-de la Fuente acknowledges there is more work to be done to clarify the ancient origins of ticks and their blood-sucking behaviors. For example, one amber specimen contains a tick engorged with blood, but Pérez-de la Fuente and his co-authors couldn't figure out how to analyze that blood because the tick wasn't entirely encased in amber, so the iron in the blood was contaminated with minerals. That specimen and the others in the study were gathered in Myanmar, which is famous for its large amber deposits. "Private collectors had actually purchased the amber online," Pérez-de la Fuente says. One collector donated a piece of amber to the American Museum of Natural History in New York. Another helped analyze ticks in amber he purchased and is listed as an author of the new study. "We actually broke the wall between private collectors and scientists which is very uncommon, especially in paleontology," Pérez-de la Fuente says. "That by itself is a success." Now we have news on the life of dinosaurs. Like in "Jurassic Park," scientists found specimens encased in amber showing that ticks sucked dinosaurs' blood. Here's NPR's Rebecca Hersher. REBECCA HERSHER, BYLINE: The amber is 99 million years old. That's from the Cretaceous Period when T. rex was around. Ricardo Perez-de la Fuente is the main author of the new study. I talked to him over skype. RICARDO PEREZ-DE LA FUENTE: You know, amber is fossilized resin. HERSHER: Resin is like sap but thicker. Critters can get stuck in it and preserved. PEREZ-DE LA FUENTE: And because of that, can actually preserve interactions between organisms. HERSHER: Interactions like a tick grabbing onto its host. For this study, published on Tuesday in the journal Nature Communications, the team analyzed multiple ticks trapped in amber. PEREZ-DE LA FUENTE: We studied one tick that is actually engorged by blood. HERSHER: Like, it had just eaten a big meal before it was entombed. The most impressive of the ticks was one that wasn't alone in its piece of amber. There was a feather trapped along with it, and that feather belonged to a dinosaur. PEREZ-DE LA FUENTE: The tick grasping the feather - that was actually very surprising. Yeah (laughter) that was something like, oh, wow, really (laughter)? HERSHER: Researchers also found tiny hairs on some of the ticks that seem to have come from some sort of nest. Together, the evidence suggests that ticks hung out in dino nests and fed on the blood of their feathery inhabitants, which is new. Ticks are very old creatures, and people who study them have long wondered what their ancient counterparts ate. It appears that feathered dinosaur is at least part of the answer. Rebecca Hersher, NPR News. Transcript provided by NPR, Copyright NPR.